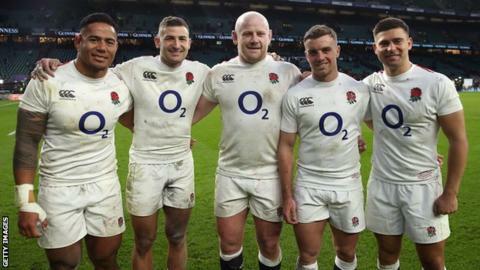 Leicester's international stars "should not abandon ship" and could still play for England in the event of relegation, says RFU boss Nigel Melville. The Tigers are 10th in the Premiership table, five points above bottom side Newcastle, with five rounds to play. A number of England's leading players, including Ben Youngs and Manu Tuilagi, are on Leicester's books, many without straight relegation clauses. "Going down shouldn't be a reason to abandon ship," Melville told BBC Sport. "I think you should be coming back up with your club and making a statement. "They are committed and loyal to their clubs. If they did come down, they would come back up because they would make sure they do." Props Dan Cole and Ellis Genge, scrum-half Youngs, fly-half George Ford, centre Tuilagi and wing Jonny May all played key roles in England's recent Six Nations campaign. While most of their contracts do include a contingency in the event of relegation, they are not thought to be straight relegation clauses whereby either the player or club could terminate the deal. But despite the gulf in quality between the top two tiers of English rugby, interim chief executive Melville said the RFU could "absolutely" select players operating in the Championship, adding they might be "fresher" at that level. "We can move forward and pick players from the Championship," he said. "It would probably mean they get more rest than they probably would at the moment which might make them fresher." The Premiership clubs remain keen on 'ring-fencing' the top flight, but Melville has reiterated the RFU's stance that there will be a team going down at the end of the season in May. "It's not just about one team, it's about the whole league," he added. "Promotion and relegation was agreed, and that's how it ends up. "It is a vibrant competition, and it shows the strength of promotion and relegation." Read more on Premiership: Are as many as eight teams still scrapping for survival?